If you have multiple components making up your home A/V system, chances are pretty good that you also have a bowl of various remotes sitting nearby. A remote for every component, and a process of using several different remotes to turn all of your equipment on. Want to watch a DVD with your surround sound? Open up the cabinet containing your equipment so the remotes have direct line of sight. Dump the bowl of remotes on your lap. Pick up the TV remote and turn the TV on. Pick up the DVD remote and turn the DVD player on. Pick up the A/V receiver remote, turn the receiver on. Using the receiver remote, switch it to the DVD input. Pick up the DVD remote again and start the movie. Pick up the A/V receiver remote again, adjust the volume to desired level. Using receiver remote, make sure the proper sound mode is selected. Place all remotes on the table next to you for pausing and volume adjustment during the movie. DVD remote batteries are dead. Run to the kitchen and get new batteries. You don’t have any batteries. Go back to the remote bowl and find batteries from an extra remote that will fit. Only the A/V receiver remote batteries fit. Take them out, put them in the DVD remote. Turn the DVD player on. Put the batteries back in the receiver remote. Turn the A/V receiver on. Swap batteries back to the DVD remote. Swap batteries back to the A/V receiver remote. Adjust the volume to the desired level using the receiver remote. Smash volume button on receiver remote because it sticks. Using the receiver remote, make sure the proper sound mode is selected. Your popcorn is now cold. Watch your movie with your cold popcorn. Here’s an example of the process using one of our programmable URC remotes. Adjust your volume to desired level. 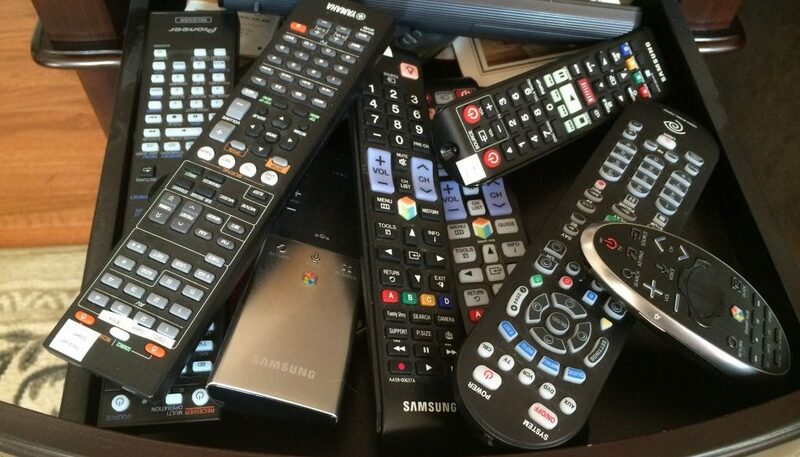 Dump the bowl of remotes into the “undesirables” drawer. Use the bowl for your warm popcorn and watch your movie. Our line of URC (Universal Remote Control) components are completely customizable for streamlining control of audio and video equipment in your home. The “simplified” explanation for how a URC remote works is that every piece of equipment you have contains command codes for various actions. These command codes are sent via the IR (infrared) signal of the remote, which also needs to have a direct line of sight with the receiving eye on the individual pieces of equipment. This is why some people need to open up the cabinets that contain all of their equipment before being able to control them. The URC Base Station goes into the cabinet with all of your home A/V equipment. From there, an individual lead runs from the base station to the IR eye on each piece of equipment. We then program the remote using proprietary software to run the commands, in the correct sequence, for the desired outcome. All those steps (or commands) listed above that were required to watch a DVD are now performed and sent by ONE remote at a single press of a button. Another advantage that our customers love about URC remotes is that the control sends the commands using an RF (radio frequency) signal. This means you no longer have to open cabinets for a direct line of sight to your equipment. They don’t even need to be in the same room anymore. The base station receives the RF signal and converts it to the sequence of IR commands giving you an incredible amount of comfort and flexibility. What Does URC Work With? Also, the beauty of URC remotes is not only their flexibility but expandability. If you remove, replace, or upgrade equipment they can be re-programmed to work and run everything the same way as before. You never have to worry about changing the setup. Just give us a call to have one of our certified URC technicians come out and program it! If you think adding a URC system to your current A/V equipment and setup will make your life easier, give us a call. We offer free on site consultations within the Tyler area and would be happy schedule a visit. Over 40 years of business and a century’s worth of combined experience is waiting to help!